It’s here. The sun’s warmth feels a bit stronger and the days are getting a little longer. Spring is the time of year when we break away from the comfort of our cozy homes and get outside. It’s really a special time for us and chances are that you enjoy outdoor activities with your companion feline too with our outdoor cat systems. Kittywalk© Systems Outdoors Cat Enclosures provides a way to allow your cat to roam in the outdoors safely and securely. Now you don’t have to supervise your cat whenever your pet goes outside. Simply place your pet in the customizable cat enclosure and let them have fun in the fresh air. These OKittutdoor Cat Enclosures are customizable. Additional pieces allow you to add on, creating unique pieces to accommodate your cat. 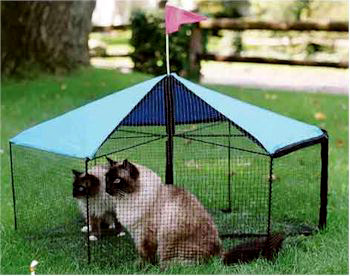 Adaptable to conform to your yard or home, they also provide more space for your cat to roam. They will just love sun bathing with your while your family and friends are enjoying the warm outdoor weather. The Premium Outdoor Cat Fence is the most versatile pet fence available anywhere. New space age technology has now miniaturized deluxe containments systems to cat size where receivers are now small enough for you’re your feline friend to wear comfortably and spend his or her time with you in the garden. Jazz, Teattle, Sophie and Seven, Cat Palace USA favorite cats, just love to go bird watching, mouse hunting and sun bathing. Enjoy your summer with your feline friends at your side in a safe environment.